In context of long pending demand of the Sikhs residing in Indian sub-continent for providing them visa-free access to Kartarpur Sahib through a corridor from Dera Baba Nanak to Gurdwara Sri Darbar Sahib, Kartarpur Sahib, Navjot Singh Sidhu’s name came in limelight after he hugged Pakistani army chief General Qamar Javed Bajwa during swearing-in ceremony of Imran Khan at Islamabad. While hugging, the Pakistani army chief talked of the plan of constructing the corridor. When I sat down at Gurudwara Kartarpur Sahib, I became drenched into a meditative state of joy unspeakable, tears flowing in my eyes. I could feel his presence after all these years. The moment I touched the soil of Kartarpur Sahib, every pore in my body was overwhelmed by Baba Nanak’s presence. Divinity is expressed through formations of nature in and around the Gurudwara Sahib in its historic establishment, clean air and serene skyline. 1. 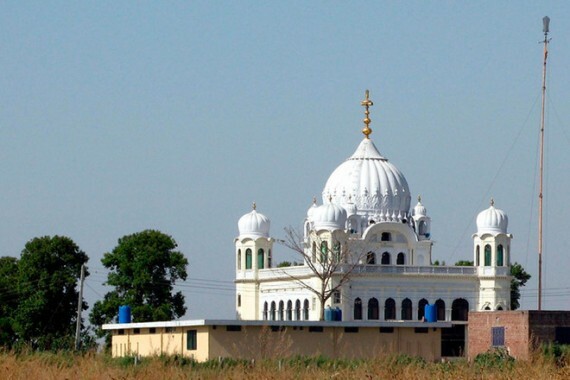 In the 104 acres of land that surrounds the Gurudwara Sahib at Kartarpur, we can avoid building of any new concrete structures and the altering of the historical structures on the sites. To protect the holy land-banks of soil which were once tilled by Baba Nanak, utilising them for organic cultivation of local food crops that must be used to serve langar to the devotees in the holy Gurudwara Sahib. Sustainable use of water from the well that Baba Nanak may have used and keeping the land covered by forest intact will serve as a symbol for the world, in rightful agricultural practices and living in oneness with mother nature. 2. I request you to regulate our movement as pilgrims: we must move primarily on foot with an exception only for elderly, disabled or sick, along with providing accessible amenities such as toilets. Personal transport should be eschewed at all costs. In 104 acres of land walking trails could be developed for people to walk along fields once tilled by Baba Nanak and now preserved in the same sanctity. 3. The new facilities for religious tourists should not interfere with current aesthetics, and must be eco-friendly; their architecture aligned to Guru period. They should be located outside and at a considerable distance from the current premises so as to not affect the current ecosystem. Exploration work should be taken up to rediscover heritage sites in Kartarpur Sahib that existed at time of Baba Nanak, leaving the architecture of all historical buildings untouched. 4. Waste disposal should be carefully planned and executed. Garbage from the use of plastic bags, bottles, Styrofoam and packaged foods has no place. 5. Furthermore, I request you encourage local and traditional artefacts to be allowed in the ‘bazaars’ around the area. We can kindly turn away any form of ‘shopping complex’ that sells fast-food or utilizes plastic wares. We can welcome folk art and the music of rabbis and folklorists to perform around the area. As Baba Nanak’s corridor opens the way to a sacred pilgrimage, it will stand as living symbols of three pillars of Sikhism ‘Naam Japna – Kirat Karni -Vand Ke Shakna’ (To medititate on God’s Name – To earn with one’s honest work – To share & consume (the very essence langar – free Kitchen). Baba Nanak’s corridor has brought us together as peoples and nations, leading us into times of shared peace and prosperity. As the Development works and plans are being finalized for the commemoration of the 550th Birth anniversary of Baba Nanak. As millions of pilgrim hearts across the world yearn for this historic moment, a huge responsibility is cast upon us. To preserve the sanctity of Kartarpur Sahib and DeraBaba Nanak Gurudwara Sahib, there are steps we can take together. 1. We can avoid the building of new concrete structures and the altering of the historical structures on the sites of Kartarpur Sahib and Dera Baba Nanak Gurudwara Sahib. 2. We can regulate our movement as pilgrims: we must move primarily on foot, with an exception only for the elderly, disabled or sick. We should eschew personal transport at all costs. 3. We can use the local lands for the organic cultivation of food crops to serve langar to the devotees in the holy Gurudwara Sahib. We can drink sustainably from the waters of Baba Nanak’s well. 5. We must plan and carefully execute waste disposal. Garbage from the use of plastic bags, bottles, Styrofoam and packaged foods has no place. 6. We can encourage local and traditional artefacts to be allowed in the ‘bazaars’ around the area. We can kindly turn away any form of ‘shopping complex’ that sells fast-food or utilises plastic wares. We can welcome folk art and the music of rabbis and folklorists to perform around the area. The banks of soil once tilled by Baba Nanak and the rapturous water of the well from which he once drank, stand as living symbols of three pillars of sikhism ‘Naam Japna – Kirat Karni -Vand KeShakna’ (To meditiate on God’s Name – To earn with one’s honest work – To share and consume the very essence of langar – free kitchen). Baba Nanak’s corridor opens the way to a sacred pilgrimage. We have a duty to devote ourselves to its future as well as its past.